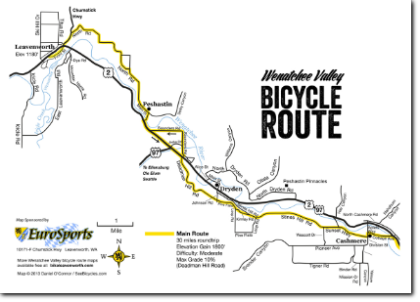 Bicyclists often creatively combine a number of different backroads and routes when riding through the Wenatchee Valley. 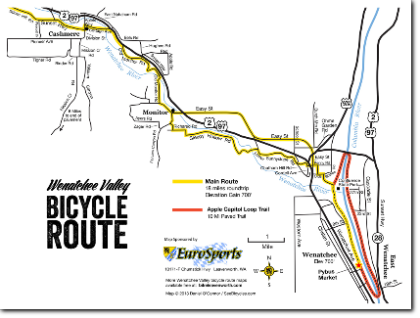 The most commonly used route to minimize use of Highway 2/97 is a combination of the Apple Capital Loop Trail, and the Fruit Loop routes designated in the maps commissioned by Eurosports in Leavenworth. (Special thanks to Eurosports for sharing the maps). 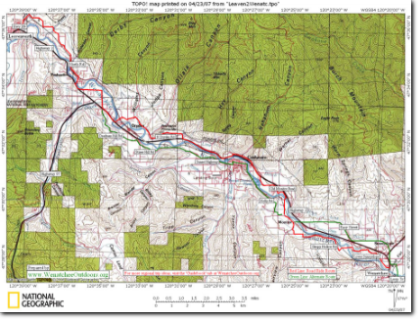 Alternative routes, particularly between Cashmere and Leavenworth, are also presented by WenatcheeOutdoors.Org below. 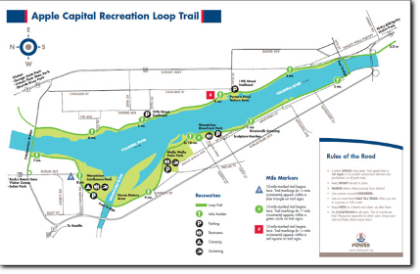 The Apple Capital Loop Trail is a paved, nonmotorized trail linking Wenatchee and East Wenatchee and the parks on either side of the Columbia River. 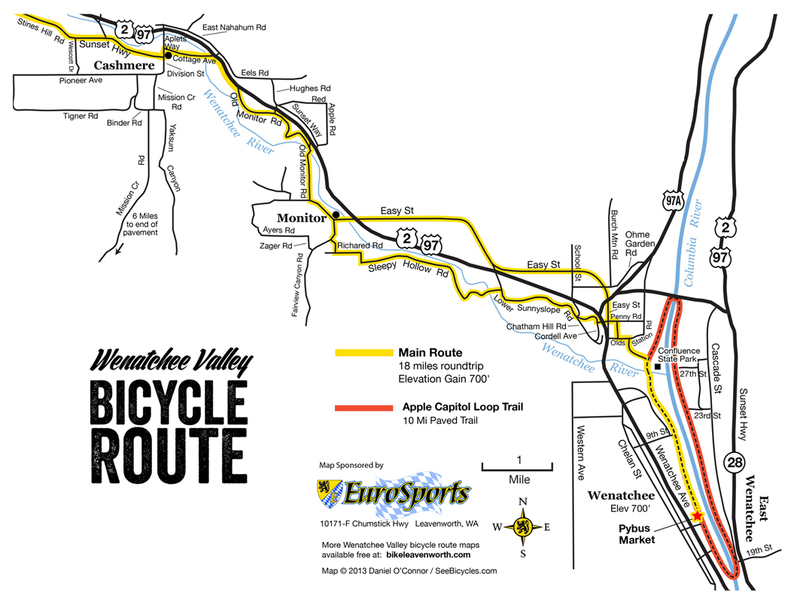 The Loop Trail is a good starting or ending point for the Wenatchee Valley Scenic Bikeway. "Fruit Loop East", or Lower Valley between Wenatchee and Cashmere. 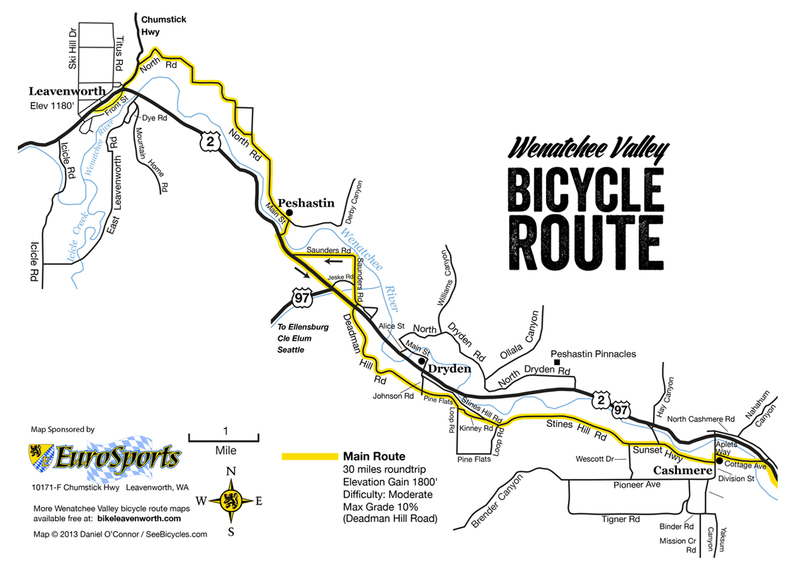 Because the Lower Valley loop includes the largest community of Wenatchee, it sees the largest number of cyclists. "Fruit Loop West", or Upper Valley between Cashmere and Leavenworth. A group of cyclists on a Wenatchee Valley Velo ride wait to cross busy Highway 2/97 in front of Anjou Bakery. Alternative routes involve crossing or riding stretches of more hazardous highway.